Now here we are, in the final quarter of 2009 and KISS has done their best attempt to remain true to their roots, or should we say balls, which they left somewhere back in 1981. Ace got sober and has delivered his trademark guitar and songs about outer space, a couple of instrumentals, and with a dandy cover of Fox on the Run. 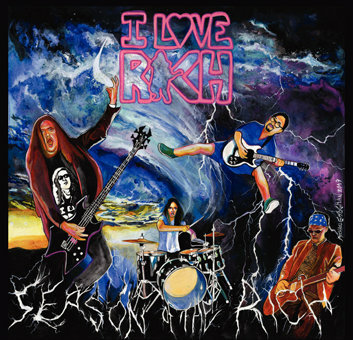 And then their our beloved I LOVE RICH, and in the 11 years I’ve been familiar with them the only thing about their formula, which was perfect over a decade ago, that has changed has been a few guitar players. That aside, this band rocks harder than their forefathers and the sound has remained consistent. Fear not, the line up is the same and as solid as it was in ’04. And though they’ve tested these songs in their shows over the last few years, they haven’t actually given us anything new to pump our fists or loved ones to at home or in the car. (note: doesn’t have to actually be a “loved” one) That is until now, “The Season of the Rich” is a 5 song CD of pure sonic Viagra. In fact, if the singer wasn’t so convinced he was so damned awesome, and he is, they may could have actually gotten away with naming this album exactly that.